We were interested in how San Francisco’s Department of the Environment (SFDoE) would respond to this finding. 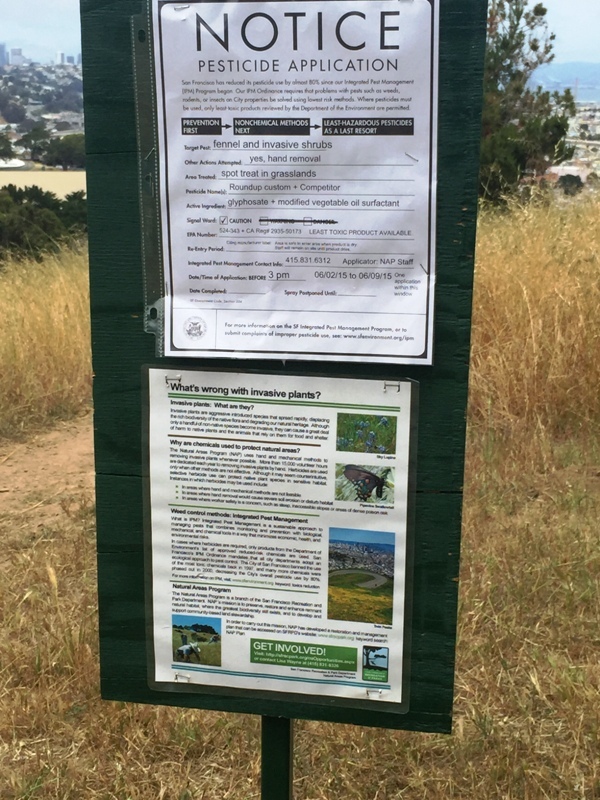 They regulate what pesticides may be used on city property, including the Natural Areas. SFDoE called a public meeting in response. 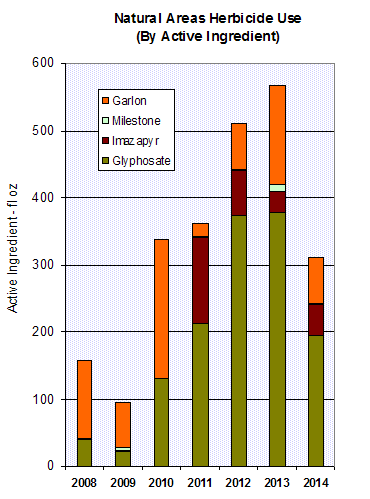 They have reclassified glyphosate from Tier II (more hazardous) to Tier I (most hazardous). We received notes from someone who attended and found it encouraging. This is based on those notes, and is not a comprehensive report on this meeting. It focuses on issues the observer considered important. This meeting drew a huge crowd. I’d say there were 100 people in the room. Chris Geiger [of the SFDoE] asked how many people were employees of public land agencies. Most were. When he asked how many people were “concerned citizens,” fewer than 10 people raised their hands. I did not see Lisa Wayne [who heads NAP] nor any NAP gardener. Chris Geiger said the meeting was organized in response to the recent categorization of glyphosate as a “probable human carcinogen” by the International Agency for Research on Cancer (IARC) of WHO. He said the purpose of the meeting was informational as well as to consider the question of how the city’s Integrated Pest Management (IPM) policy should respond to the new classification. In that regard, Geiger announced that the city has reclassified glyphosate as a Tier I pesticide (most toxic). The presentation was made by Susan Kegley, Ph.D. Chemist and Executive Director of Pesticide Research Institute. She is the author of the risk assessments of herbicides for Marin Municipal Water District and California Invasive Plant Council. Dr Kegley described the process used by IARC of WHO to classify pesticides. Usually, they publish a monograph which details all of the studies they reviewed in making their decision. In this case, they have yet to publish the monograph and so much of what Dr Kegley said was speculation about what studies they used to reach their decision. Based on the studies she summarized, the evidence of glyphosate causing cancer in humans is “limited” but the evidence of glyphosate causing cancer in laboratory rats and mice is stronger. An employee of SF’s Public Utilities Commission (PUC) demanded that the IPM program tell the PUC they must continue to use glyphosate because he can’t deal with weeds without it. He was disruptive and behaved inappropriately. Mr Geiger asked him politely to “stand down.” This employee illustrates how the use of pesticides is in the hands of irresponsible public employees. Mr Geiger then asked employees of public lands to explain what they are using glyphosate for. Kevin Woolen of SFRPD described his efforts to reduce herbicide use by SFRPD. He sounded responsible and convincing. Good public relations for SFRPD. A concerned citizen asked an excellent question about climate change. Basically she asked why herbicides are being used to kill non-native plants that are better adapted to the changed climate and asked if it is still realistic to try to re-establish native plants that may not be adapted to the changed climate. We thank the observer for that report. We are pleased that glyphosate has been reclassified as Tier I; we have been asking for this for some years. More importantly, we ask that NAP stops using herbicides in the Natural Areas. Trying to kill off the plants that grow naturally in order to introduce others that have difficulty surviving in our city is a waste of resources and a poor reason to add toxins to our wild lands. We are pleased that Dr Kegley focuses on alternatives to using herbicides. We suggest that in Natural Areas, the best alternative is – let them be. Incidentally, Mr Brastow is wrong; evolution happens all around us all the time. We’re reminded of the talk by Dr Scott Carroll at the Commonwealth Club last year. Evolution is visible in the bugs that develop resistance to antibiotics, in the weeds that develop resistance to herbicides, and even in creatures that evolve to adapt themselves to newly available natural resources.